My Guide Americo, a pleasantly mannered local Cusqueño smiled at me as I placed my foot on the first wrung. “There are about 1,000 more, and we’ll be at the top” he said. 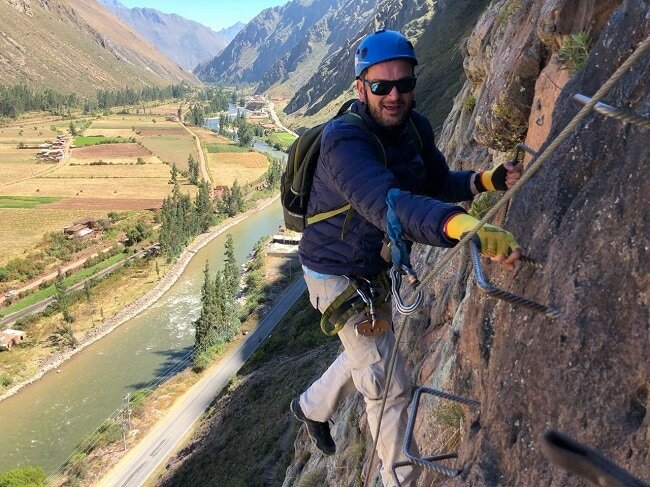 “Then a few fast ziplines and we’ll be down again.” After meeting the sales team of Vive Natura at a recent travel convention in Lima, I had been invited to experience their Via Ferrata and Zip Line experience; and as someone who spends most of his time behind a desk, you might say I was rather excited! 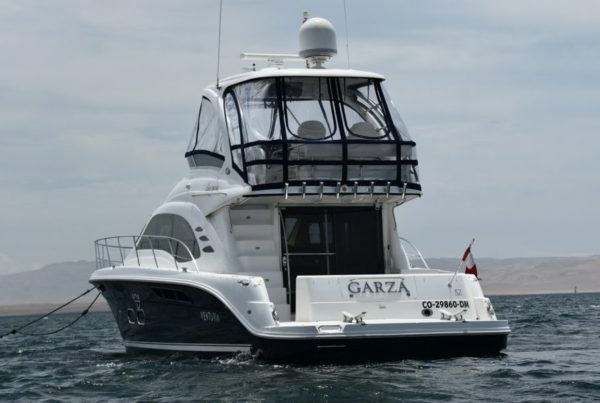 This could be the best Family Adventure Activity in Peru. Natura Vive which was founded by a Peruvian and Colombian partnership shot to fame a few years ago when they created the Sky Lodge Adventure Suites, a rather unique hotel consisting of 3 sleeping pods and a dining pod clasped to the side of a mountain. Constructed from aerospace grade aluminum and Plexiglass, the cigar shaped pods resemble a craft that you might use to fly to the moon, rather than a place to spend the night. Branded as a hotel with 10,000 stars and featured by CNN, Lonely Planet & Foders (to name a few), the Sky Lodge Adventure Suites is one of the quirkiest ways for adventure travelers to pass the night. 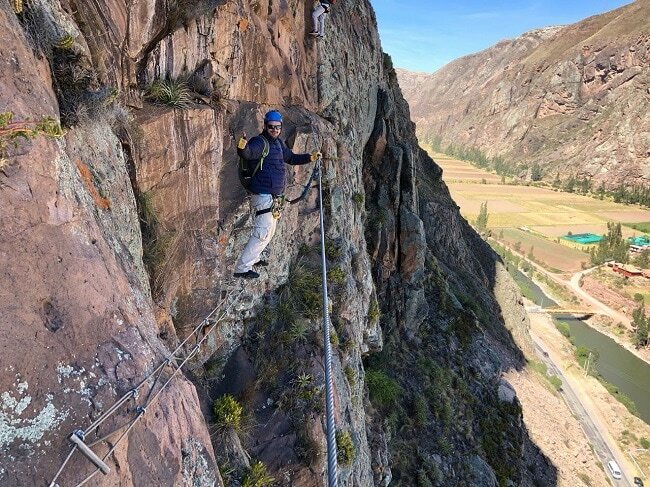 To make the whole experience more fun, thrill seekers will be pleased to know that access to the Sky Lodge Adventure Suites is gained by climbing a via ferrata 400 metersup a sheer rock face. Then, after spending a night perched on a mountainside, getting down is equally as fun with a series of seven zip lines spanning 2,800 meters (9,186 feet). Natura Vive offer several different adventure packages depending on what you want to do. The full package includes the via ferrata ascent, a night in the Sky Lodge and the zip line descent. For those that only have time for a day trip, then there is also the option to do just the via ferrata and zipline activities. 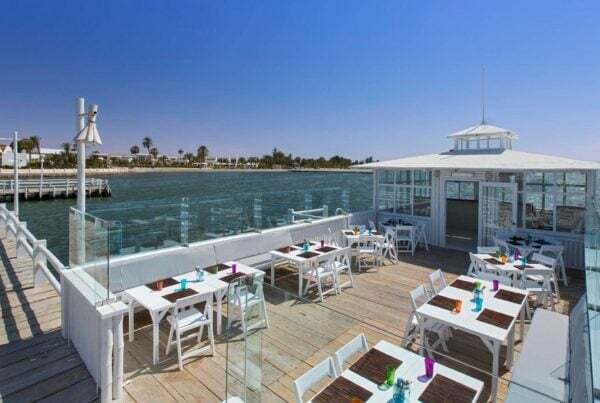 If you want to make the adventure even more special there are also dining options available too. A via ferrata is a series of steps fixed to the side of a mountain. Simply put, it is a way that people with no rock climbing experience can scale a rock face. In this case, the via ferrata climbs some 400 meters (1312 feet) up the rock face, with steps or crevasses in the rock in easily manageable intervals (a bit like climbing a regular ladder). 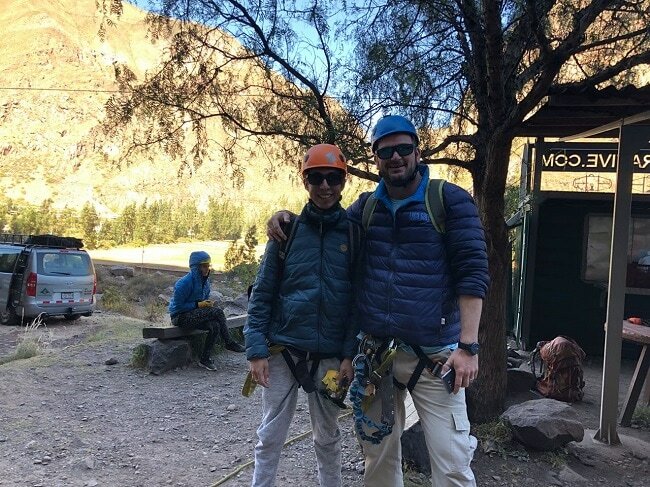 To make sure that you are safe, you’ll wear a waist harness with a double safety clip system that allows you to always be connected to the metal safety wire that runs the complete length of the via ferrata. 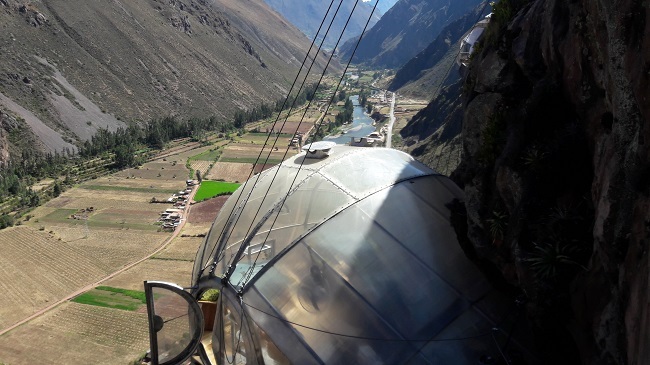 After taking some time to admire the scenic views of the Sacred Valley, you’ll begin the zip line descent. After an equipment safety check and adjustment if needed, a series of 7 zip lines totaling a distance of 2,800 meters (9,186 feet) will take you back to the valley floor. The first zip is a relatively short line of just 150 meters (492 feet) and allows you to get you accustomed to the experience of zip lining without blowing your socks off! For those that are not comfortable running the zip line on their own it is possible and safe to do a tandem run. Good for families with younger children (or perhaps children with nervous parents). The following 6 zip lines vary in length and speed, with the longest stretching 700 meters (2297 feet). Natura Vive seem to tick all boxes when it comes to safety. Their guides show a high level of professionalism, and clearly care about making sure everyone is safe. 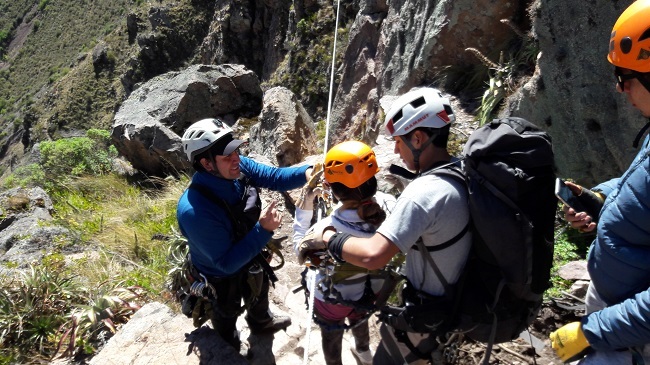 I was pleased to see that the guides took their time to fit the safety equipment and paid careful attentionto the smaller details like adjusting the helmets and making sure everyone was comfortable in their harnesses. It was also good to see a well-presented safety briefingintroducing the equipment, the techniques to be used and what to expect. After scaling the via ferrata and preparing for the zip line decent, the guides checked and double checked the harnesses to make sure everything was well-fitted and also provided a different set of gloves for the decent. We were well informed at the start of each zip line what to expect, and we were sent off on our way in a calm fashion without being hurried. I liked that! Of course, adventure activities are no for everyone, but if you like to have some fun and perhaps do something that you have never done before, then this is for you. It is a great way to relax, test yourself, feel a little adrenaline is a great way to have a break from visiting archeological ruins. For me, I really enjoyed the slow pace that we advanced the via ferrata. It was a moment to really relax and get away from everything. At no point did I feel intimidated by the task ahead, or did I feel unsafe. The views were spectacular, and the tranquility of the experience made for a relaxing day. If you are considering doing this with your family (including younger children), then this is a really good option. As parents, your kids will think you are the coolest parents on the planet for including this. Natura Vive set a minimum age limit of 7 years old for children. As this is an adventure activity, you’ll be expected to have a certain level of fitness in order to climb the via ferrata. From a personal standpoint, I think that a medium level of fitness is all that is required. If heights and a bit of physical activity don’t phase you, then this is for you! For those that have a fear of heights this is NOT for you. Contact one of our travel experts today for more information on this activity. 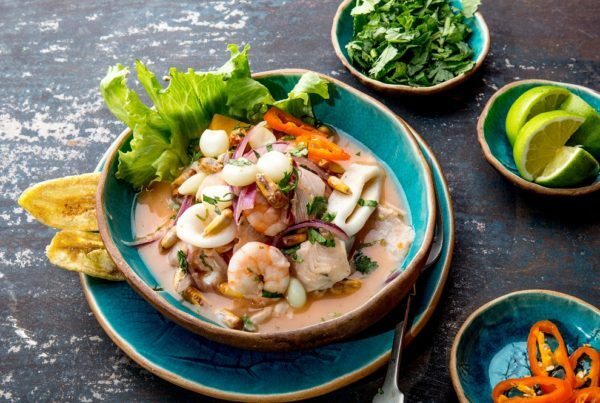 Our team of Peru Travel Experts can easily incorporate this into your Peru Vacation. Let us help you plan a memorable trip to Peru – Contact Us Today.